The humidity is at 79% at the moment, and it’s days like today that I think of what the Wicked Witch in the Wizard of Oz felt like as she melted into the ground. Because that’s exactly how I feel, I feel like I’m melting. I have a love/hate relationship with the weather here in Brisbane. I love the mild winters, and the fact I don’t really have to own any bulky winter clothing as I can pretty much wear my beloved dresses year around, only with a winter addition of tights and boots. But summer, summer is a different story. It’s sticky and uncomfortable. And there’s nothing worse than working up a sweat simply by brushing your teeth in the morning or even the moment you step out of a cold shower in a vain effort to cool down. Of course there’s air conditioning, but as power prices go through the roof, and the memory of an $800 electricity bill lingers we try to cope with it as best we can, only resorting to air conditioning when absolutely necessary. So pedestal fans and cooling foods such as watermelon, salads, ice creams and sorbets become the order of the day. 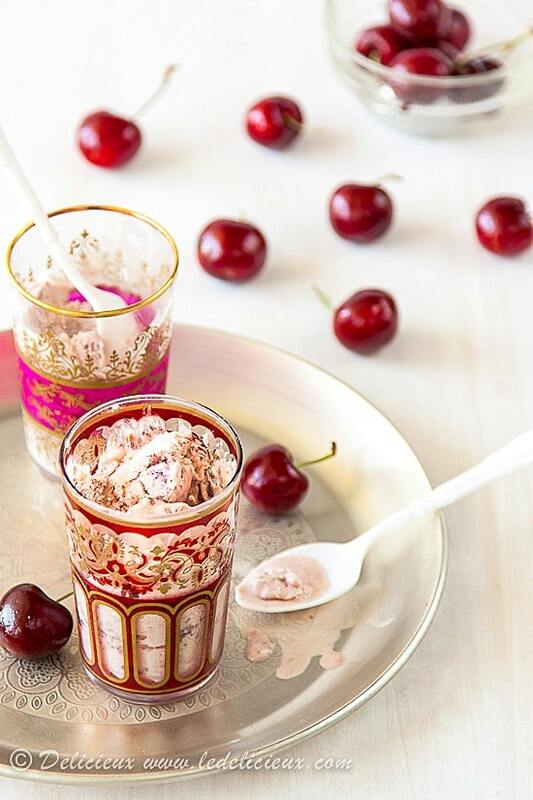 As beautiful cherries still abound at the greengrocer I am determined to make the most of them before they disappear, which is how this Cherry Ice Cream came together. You might remember the vanilla roasted cherries I created for my Black Forest Cheesecake Parfaits, well, I’ve resurrected them again, but this time I’ve gone with a stove top sugar free version because frankly it’s too hot to have the oven on. Simply cook the cherries down until they are beautifully soft and pliable and set aside to cool. For the cherry ice cream base, I’ve stepped away from my usual custard base which I use for most of my ice creams after stumbling across this beautiful recipe for Roasted Peach Ice Cream on Tartlette. I love the simplicity of the base used here, which is a simple combination of milk, cream and coconut milk with the sweetness of honey in place of sugar. On hot days simplicity is key. 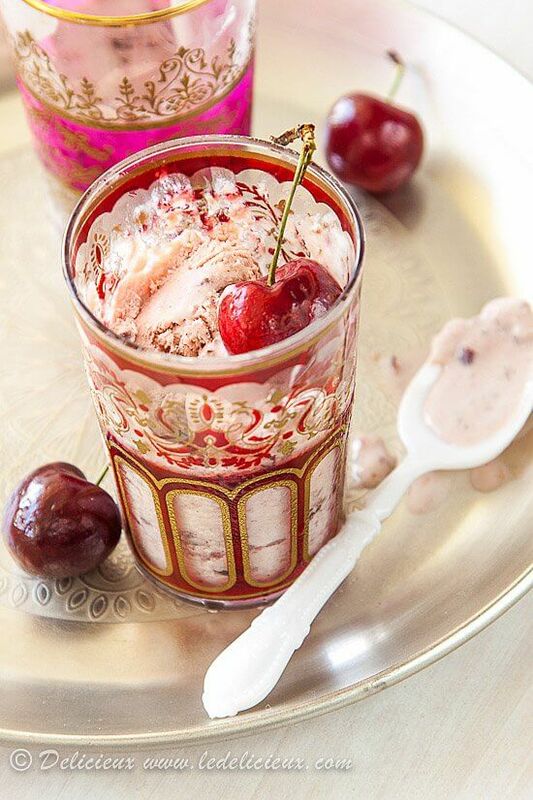 Serve this sugar free cherry ice cream in a cone or bowl, or as I like to do, in a mug or glass. Tell me, how do you eat your ice cream? Are you a bowl, cone, glass or mug person? Place the cherries, honey, water, vanilla seeds and bean in a saucepan and place over a medium heat. Bring to a simmer and reduce to low and cook until the cherries soften and the syrup begins to thicken. Set aside to cool completely. Combine the cream, milk, coconut milk and honey in a saucepan over a medium heat. Bring to the verge of boiling and remove from the heat and set aside to cool before refrigerating until cold. Remove the vanilla bean from the cherry mixture and process the cherries in a food processor until roughly chopped. Remove the milk and cream mixture from the refrigerator and stir the cherry mixture through. Add the vodka and stir through as this will help prevent the mixture from freezing completely and make for a softer ice cream straight from the freezer. Pour into your ice cream maker and churn according to the manufacturers instructions. Remove the mixture from the ice cream maker and freeze in a resealable container. Freeze for 3 to 4 hours before serving. Looks delish – and I agree with the sentiment about the heat! How many ways are there to eat ice cream? I love them all. In a bowl, in a cone (pointy OR flat), in a glass, in a glass with fizzy stuff, with chocolate sauce (or any other sauce) between two wafers, alongside cake or pie – do I win the prize? Your cherry ice cream must come to visit my kitchen. It’s so pretty! I made a cherry ice cream for Christmas which was cream based rather than custard based and found it really quite grainy. The recipe I used contained sugar but this was melted at the start – the graininess was from the fat content of the cream. Did you have a similar problem? I am standing in Central Station at the moment waiting for my train. If humidity is 79% in Brissie then I swear it is 90% here! Would love some of your icecream about now in a cup please for us GFers! What a lovely idea….adding vodka. I was in Brisbane last week…what a hot and sticky , scorched person I am now….still it was fun and I loved it. Ooh sugar free how wonderful. It is meltingly-hot at the moment isn’t it? The other day it was like being on holidays in South East Asia without the cocktails by the pool! It depends where I am. At home I like ice-cream in a bowl but at a store it has to be in a cone. Except gelato, I like that in a cup. Oh I am contrary aren’t I? That looks absolutely delicious. I don’t have an ice cream machine, so very rarely bother to make ice cream, even though I love it. I did make a very simple cherry sorbet last season which was lovely. Chop 300g pitted cherries and freeze. Whisk in a mixer with a whisk attachment on medium speed for a few minutes to break up. Add 1/2 cup caster sugar and 2 large egg whites and whisk on high speed for 5 mins, until more than doubled in volume. Place in a container and freeze at least 4 hours. Serve on its own or with other berries/fruit. This sounds so yummy! 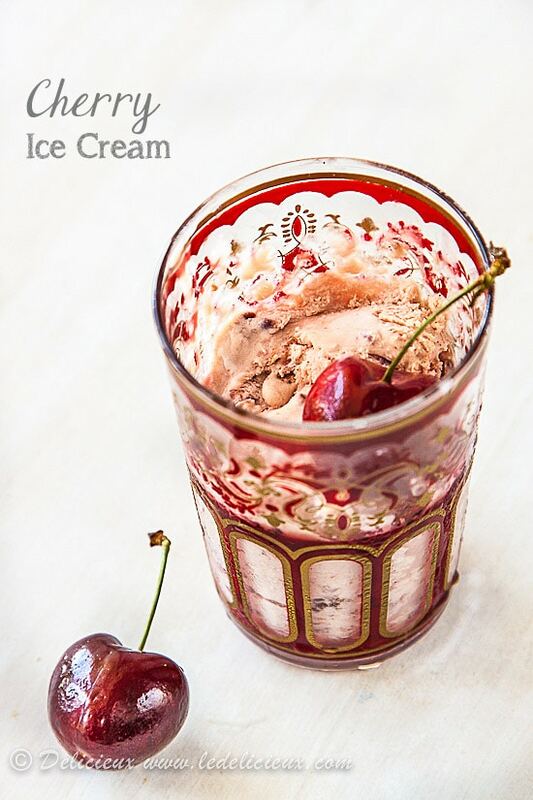 I really want to make this because my fiance loved cherry ice cream and he would love this recipe. I also love the photos. This ice cream looks delicious and just the thing for a hot summer’s day! It must taste divine! 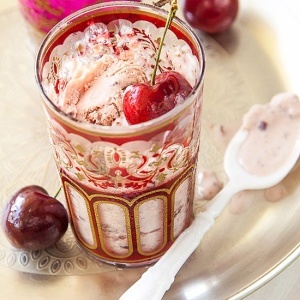 I’ve never made cherry ice cream… Lovely clicks.